Rancho Santa Anita has justly earned its reference as the “fairy spot of the Valley.” The rancho peaked under the ownership of Hugo Reid when hides and tallow furnished a stable economic base and fine mission plantings flourished in a benevolent climate. Scarcely two years after he received full title (1845), however, the quixotic Reid found himself tired of life as a ranchero and on the brink of insolvency. Rancho Santa Anita was purchased by Reid’s friend and Rancho Azusa neighbor, Henry Dalton. During the ensuing decade and a half, the title to Rancho Santa Anita passed through a number of hands. In 1881 Henry Dalton by lost the homesite in a mortgage foreclosure. Joseph A. Rowe, owner and star equestrian of Rowe’s Olympic Circus, paid $33,000 cash for the land on which he planned to make his permanent home. An additional $6,000 went into rebuilding the crumbling Hugo Reid Adobe. Rowe’s eventual financial mismanagement and ranching inexperience finished the ranching career of the only owner to actually lose money on his investment in Santa Anita. In 1857, Rowe borrowed $12,500 at 24% interest to cover his debts, and when that proved insufficient he managed to find a bidder for the ranch itself, an investment partnership that paid a mere $16,645 for title to Rancho Santa Anita. Joseph Rowe quietly left for Australia after clearing $2,300 on his $33,000 land investment. The unlikely combination of Albert Dibblee, San Francisco vigilante coordinator, and William Corbitt and Mr. Barker, Los Angeles promoters, had purchased Rancho Santa Anita sight unseen from the floundering Rowe. Unfortunately, almost three years of devastating drought that put an end to cattle ranching in Southern California and their plans. In 1865 the partnership made the first of what would become many divisions in Rancho Santa Anita, selling the land in two sections. The smaller, 2,000 unimproved acres in the west, was sold to a German merchant and entreprèneur, Leonard Rose, at $200 an acre, while the heart of the rancho, 11,319 acres surrounding the homesite, went to ex- trapper, William Wolfskill for $20,000. ca. 500 B.C. A native village later identified by Hugo Reid as Aleupkigna (“place of many waters”) is established near the-natural lake on today’s site. 1771 Mission San Gabriel is founded. Native inhabitants are referred to as “Gabrielinos.” Ca. 1800 Rancho Santa Anita is established as an agricultural outpost of Mission San Gabriel. 1839 Don Perfecto Hugo Reid petitions for 3 square leagues (13,319 acres) of Rancho Santa Anita. He will receive provisional title in 1841 and full title in 1845. 1840 Hugo Reid constructs “a house of stone” near the lake at Santa Anita. 1847 Henry Dalton purchases Rancho Santa Anita from Hugo Reid for $2,700. 1854 Dalton sells Rancho Santa Anita to Joseph Rowe for $33,000. 1865 William Wolfskill purchases 11,319 acres of Rancho Santa Anita for $20,000. 1872 William’s son Luis Wolfskill sells about 8,500 acres of Rancho Santa Anita, including the lakeside property, to Harris Newmark for $85,000. 1875 Elias Jackson “Lucky” Baldwin purchases Rancho Santa Anita for $200,000. ca. 1877 Baldwin renovates the Hugo Reid Adobe, creating an 8-room, L-shaped home with a new wooden wing attached to the old adobe structure. ca. 1879 The red and white Coach Barn is constructed. ca. 1880 Baldwin imports peafowl from India to adorn his new Santa Anita property. 1885-86 The Cottage, Baldwin’s guesthouse, is completed on the shore of Baldwin Lake. ca. 1887 Lucky Baldwin deepens the lake basin by 10-12 feet and lines the perimeter with a granite boulder-topped wall. 1890 The Santa Anita Depot is constructed at today’s Colorado Blvd. and Old Ranch Rd. using Baldwin-manufactured bricks. 1909 Lucky Baldwin dies of pneumonia in his Adobe home. 1912 Anita Baldwin constructs her own 50-room home, Anoakia, at the corner of today’s Baldwin Ave. and Foothill Blvd. 1936 Anita Baldwin sells the remaining 1,300 acres of Rancho Santa Anita to Harry Chandler of the Los Angeles Times. 1936-47 Chandler’s real estate organization, Rancho Santa Anita, Inc. undertakes subdivision of the old ranch lands. 1947 With urging from Dr. Samuel Ayres’ Arboretum Committee of the Southern California Horticultural Institute, the State of California and County of Los Angeles jointly purchase 111 acres from Rancho Santa Anita, Inc. to create an arboretum around the Baldwin home-site (deed granted Feb. 17; recorded Oct. 2). 1948 The California Arboretum Foundation is incorporated as a non-profit organization to sublease and administer the Los Angeles State and County Arboretum (Feb. 20). 1948 Dr. Frans Verdoorn is hired as the first Director of the Arboretum (Oct. 1). Dr. Verdoorn secures the first 1,000 volumes for an Arboretum library. George Spalding is hired as Arboretum horticulturist. 1949 An Historical Committee is created under Susanna Bryant Dakin to oversee the restoration of the historic buildings on The Arboretum grounds. 1949 The first Arbor Day ceremony is held at The Arboretum with the planting of a holly oak near the Coach Barn. 1949 Los Angeles County purchases a 9-acre, 200-foot wide strip along the eastern boundary (Baldwin Ave.) from Rancho Santa Anita, Inc. to create an esplanade and parking area. 1949 Pre-fabricated wooden buildings are erected on the grounds at the Old Ranch Rd. gate. The larger serves as an administration building/library and the other is the caretaker’s residence. 1949 The first Arboretum greenhouse with adjoining lath house is constructed in today’s African section. 1949 All plants growing on the grounds are inventoried and mounted specimens are made for Herbarium files. 1950 A Master Plan created by Harry Sims Bent is adopted by the County of Los Angeles and the California Arboretum Foundation. 1950 Dr. Russell Seibert is appointed Director of the Arboretum (June 1). 1950 County capital improvements include removal of trees from road areas, grading of roadways around the lake and west acres, and re-positioning of the lake outlet from south to north. 1950 An official weather station is established on The Arboretum grounds. 1950 Test plantings of Eucalyptus and Acacia are established in today’s Australian section. 1950 Los Angeles County contributes $34,000 toward an Arboretum research program for testing, propagation and introduction of new species and varieties of plants from worldwide sources. 1950 Volume 1, No. 1 of LASCA Leaves, an Arboretum quarterly journal, is issued (October). 1951 The first permanent plantings on The Arboretum grounds are initiated with some 1,000 trees. 1951 County capital improvements include grading the remainder of the major road system and installation of water main and sewage lines. 1951 The new Baldwin Avenue alignment is set; through access from Colorado Blvd. to Huntington Dr. will be available within a year. 1952 Restoration of the Queen Anne Cottage begins under the direction of the Historical Committee. It will be completed in 1953. 1953 The California Arboretum Foundation relinquishes direct management of The Arboretum to Los Angeles County, which establishes a new Department of Arboreta and Botanic Gardens to administer the property (July 1). 1953 Two additional parcels of land are purchased along Baldwin Ave. to bring the Arboretum to its present 127 acres. 1953 The first greenhouse is constructed for the new nursery/propagation area in the northeast corner of The Arboretum. 1953 The first wing of the Service building is begun. The complex will be completed in 1955. 1954 Photograph and slide files are begun. 1954 A hedge of bamboo (Bambusa oldhamii) is planted along the Baldwin Ave. fence as a sight and sound barrier. 1954 Public restrooms are completed at the Baldwin Ave. entrance. 1955 The Arboretum is formally opened to the public (Jan. 9), though tours are available on Sundays only at first. 1955 The Herb Garden is laid out by members of the Herb Society of America, Southern California unit. 1955 Director Seibert resigns. Dr. William Stewart becomes the new Arboretum Director. 1956 Color postcards of Baldwin Lake, the Queen Anne Cottage, the Coach Barn and the Jungle area are sold by CAF. 1956 The Herb Society of America plants a Victorian Rose Garden not far from the Herb Garden. 1956 The Annual and Perennial test and display garden is laid out in semi-circular beds in the west acres (today’s Meadowbrook). 1956 Archaeological work is begun in the Hugo Reid Adobe courtyard. The project will continue through 1958. 1956 California State Assembly Bill #430 authorizes the Arboretum to distribute new plant introductions at cost to commercial nurseries. 1956 Storm drains are completed underground across the entry (Bauer Pool) lawn. 1956 The Administration building and Gatehouse complex is completed. 1956 The Arboretum is opened to the public on a 7-day a week basis (December). 1957 The first 3 of 4 orchid greenhouses are constructed just west of the service area. 1957 Avocados, ornamental figs and an economic fruit orchard are added to Tallac Knoll plantings. 1957 A formal Youth Education program is initiated with Saturday and after school classes for children. 1957 A formal Adult Education program begins in the fall. with eight classes taught by staff members. 1957 A school field tour program is begun using staff as guides. 1957 A system of grid markers is installed throughout The Arboretum at 200-foot intervals to facilitate a complete mapping of the grounds. 1957 Research topics include plant introductions, fire retardant plants, smog and plants, turf grasses, oak root fungus, and experiments with gibberellic acids. 1958 Sunset Home Demonstration Gardens are dedicated (May). 1958 The Lucky Baldwin Coach Barn is restored by the State of California. 1959 The Southern California chapter of the American Begonia Society donates a glasshouse for the Arboretum begonia collection. 1959 The Library/Lecture Hall complex is completed. 1959 The Biblical Garden atop Tallac Knoll is completed. 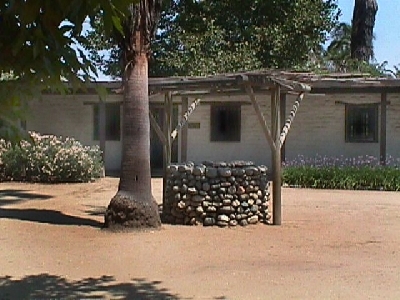 1959 Reconstruction of the Hugo Reid Adobe is undertaken by the State of California. Four native kiys are part of the project. 1959 Restrooms in the Historical Section are completed. 1960 The Arboretum auctions off almost 150 peafowl. 1960 Pancho the burro arrives at The Arboretum. 1960 Demonstration turf plots are planted north of the Library as is a display of ground covers. 1960 A formal Herbarium is started with specimens dating back to 1949. 1961 Grading begins and water lines are installed for the entryway project. 1961 A citrus grove is planted around the Rose Garden. 1961 The Baldwin Boathouse is reconstructed on its original site near the Queen Anne Cottage. 1963 The entryway project, consisting of the central Bauer Pool and gateway (or McFie) Pool, is completed and lawns are planted between the pools and out to Baldwin Avenue. 1963 The South American plant section is moved from an area near Old Ranch Rd. to the south slope of Tallac Knoll. 1964 Over 70 trees are moved from other areas of the Arboretum to the formal entryway near the Bauer and McFie Pools. 1966 A 215-car parking lot is constructed at the south end of the Arboretum to replace parking which must be ceded on the north for new freeway access. 1967 Las Voluntarias, The Arboretum volunteer group created by Maria Stewart, is formally organized. 1967 Peacock Pavilion is completed with a coffee shop on the upper level and Gift Shop/CAF offices below. 1968 Training programs for volunteer school tour leaders begin. 1968 A juniper display garden is planted just north of the Library. 1968 George Spalding starts the Plant Information “hot line” at the Arboretum. 1969 The month of January breaks a 20-year rainfall record with 20.49 inches recorded, including 7.16 inches on a single day. 1969 Ground is broken for relocation of the old Santa Anita Depot to the south parking area of The Arboretum. The Depot will be dedicated the next year. 1969 The Manfred Meyberg waterfall is constructed with cascades from the top of Tallac Knoll. 1969 A fire starts in the jungle and rapidly spreads through the Historical Section and into a nearby neighborhood (Dec. 26). 1970 Francis Ching is appointed Director of the Department of Arboreta and Botanic Gardens. 1970 The first Baldwin Bonanza is held in the Lecture Hall under volunteer chairman Alice Frost Douglas. There will be no Bonanza in 1971, but the sale resumes in 1972 with a focus on plants and has continued yearly since. 1970 The Research building is completed between the nursery and service yard areas. 1970 The Baldwin Boathouse and Gabrielino kiys destroyed in the 1969 fire are rebuilt. 1971 A series of Sunday afternoon lectures given by staff for the public begins a 10- year run. 1971 The Aquatic Garden is completed on top of Tallac Knoll. 1971 The first Queen Anne Frolic is held on the lawn in front of the Cottage. The dinner/dance fund-raiser will continue as a biennial event through 1985. 1971 The Gift Shop adds books, plants and craft items made by volunteers to its inventory. 1972 A series of Sunday morning guided walks led by staff members begins what will be a 10-year run. 1972 With completion of the Foothill (210) Freeway, The Arboretum joins with the City of Arcadia in a planting project along the new Baldwin Ave. median strip and in areas adjoining on and off ramps. 1972 Arbor Day celebrations held at The Arboretum are discontinued in favor of in-school tree planting programs. 1972 The Annual and Perennial Garden is replaced by Meadowbrook, with its 1,000-foot winding stream and plantings that emphasize seasonal color. 1972 The Garden for All Seasons is begun north of the juniper collection by Las Voluntarias as a combination flower and vegetable garden. 1972 Under President Alice Frost Douglas, CAF initiates a drive, which increases membership from 700 in 1972 to over 2,000 in 1974. 1973 George Spalding writes A History of The Arboretum – The First Twenty-Five Years. 1973 A new Gatehouse is constructed just east of the entrance steps, and visitors are now directed to enter The Arboretum through the Rotunda. 1974 Loran Whitelock donates an extensive collection of cycads for placement in the Prehistoric and Jungle Garden. 1974 The first Spring Extravaganza is held at The Arboretum with horticultural exhibits, demonstrations and lectures provided by staff and various plant societies. Spring Extravaganza will continue yearly through 1978. 1975 The Tropical Greenhouse is completed and opened to the public. 1975 A new entranceway is completed off Baldwin Ave. with a curving drive around a new fountain and pool. 1975 A large natural materials mural of the Queen Anne Cottage, designed and executed by volunteers Grace Robinson and Ruth Brankey, is hung in the Rotunda. In 1978 they also created a second mural depicting a lake scene. 1975 Arboretum attendance for fiscal year 1974-75 is 836,933, an all time high. 1976 The Prehistoric and Jungle Garden is completed with additional cycads plus ferns, dawn redwoods, gingkoes and magnolias that share a prehistoric lineage. 1977 The 450-volume horticultural library of German Seed Co. is donated to The Arboretum Library. 1977 LASCA Leaves is incorporated as an 8-page insert into a new, bimonthly national magazine, Garden. 1978 California State Proposition 13 is approved by the voters in June. Staff positions are lost immediately, and in August The Arboretum inaugurates entrance and tram fees to offset budget cuts. Fees are $1.00 for adults, 50 cents for children and seniors and $1.00 per person for tram seats. 1978 Youth Education programs are terminated due to personnel losses. 1978 A volunteer mapping crew begins a quadrant by quadrant survey of all plants on The Arboretum grounds. 1978 The first Christmas Open House for the public is held at the Queen Anne Cottage. 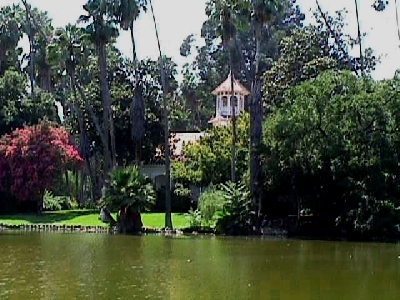 1979 Los Angeles County initiates “free admission” day at The Arboretum on the third Tuesday of every month. 1979 Four ongoing research programs are terminated due to personnel cutbacks. The entire research division would be shut down in 1981. 1979 The California Arboretum Foundation funds the first summer Horticultural Student Intern program at The Arboretum. 1979 CAF and Arcadia Chamber of Commerce co-sponsor a fund-raising concert on the lawn featuring Les Brown. Summer concerts would continue with various artists into the 1980’s. 1979 Flagstone walkways replace dirt paths in the Herb Garden. 1979 Fall Garden Fair replaces Spring Extravaganza through 1980. 1980 A major windstorm fells over 100 trees including 60 eucalyptus and the 104-yearold coast redwood planted near the Coach Barn by Lucky Baldwin. 1980 Seven coast redwoods are planted in the grassy triangle near the Historical Section restrooms. 1980 The Queen Anne Cottage and Coach Barn are recognized for inclusion on the National Register of Historic Places. 1980 Construction begins on the 8,900 sq. foot Hall of Environmental Education. It will be dedicated in 1981. 1981 Private contractors are employed for lawn mowing, weed control and maintenance of Baldwin Ave. parkways. 1981 The reconstructed Baldwin Boathouse is destroyed by vandals. 1982 Arboretum admission fees increase to $1.50 for adults and 75 cents for seniors and children. Tram fares also increase to $1.50 per seat. 1982 A 4-panel Interpretive Center is constructed in the African section. 1982 Fall Garden Show is inaugurated at The Arboretum. The weeklong shows would continue annually through 1989. 1983 The Hall of Environmental Education is re-dedicated as Ayres Hall in honor of the founding father of The Arboretum. 1983 The Gift Shop relocates from Peacock Pavilion to an expanded version of the old gatehouse at the former exit-way. 1984 New walkways are constructed west of Ayres Hall with monies donated by Garden Show 1983 steering committee. 1984 The Australian section Interpretive Center is completed. 1984 The California Conservation Corps completes a year-long restoration of the Hugo Reid Adobe, courtyard and nearby kiys. 1984 A computer system is installed in-house for processing plant records. 1985 Landscaped steps and landings are constructed to connect Sunset Home Demonstration Gardens to Ayres Hall, with labor and materials donated by California Landscape Contractors Association. 1985 The Rotunda is remodeled and enclosed to accommodate 4 new ticket stations. 1986 Construction of the Library annex adds 3 new offices on the east side of the Library building. 1986 Ground is broken for the Henry Soto Water Conservation Garden. 1986 With a grant from the California State Air Resources Board, twin smog greenhouses are constructed in the African section to demonstrate the effects of smog on plants. 1987 Arboretum admission fees increase to $3.00 for adults, $1.50 for seniors and 75 cents for children. 1987 A Special Events Coordinator position is added with responsibility for rental of the grounds and facilities for groups, weddings, etc. 1987 A volunteer Speakers Bureau is formed to take narrated slide programs out to community groups. 1988 The State of California quitclaims its interest in The Arboretum to the County of Los Angeles (April). The deed of transfer will be recorded Feb. 23, 1989. 1988 CAF sponsors publication of Don Hodel’s book Exceptional Trees of Los Angeles. Thirteen specimens from The Arboretum are included in the book. 1988 A new 4,500 sq. foot orchid greenhouse is constructed just east of the older orchid houses. Innovative features include rolling benches, motorized screens, and Dynaglass walls and ceilings. 1988 A state grant is secured to install fire sprinkler systems in the Queen Anne Cottage and Coach Barn, and to upgrade alarms in each of the historical buildings. 1989 CAF acquires professional photographer Bill Aplin’s collection of plant and landscape prints and transparencies. Volunteer Ken Quigley takes on the job of accessioning and cataloging the collection. 1989 Garden magazine is replaced by the California Arboretum Foundation News. 1990 Director Francis Ching retires. Rumors abound of a possible merger of the Department of Arboreta and Botanic Gardens with the Museum of Natural History, but the proposal is tabled. 1990 Landscaping begins on the 7,000 sq. foot Grace V. Kallam Garden located on the west side of Meadowbrook. 1990 Peacock Cafe is renovated with new kitchen, new interior decor and construction of extended outdoor dining terraces. Brown Jordan designs a line of peacock feather motif furniture for the project. 1991 Ken Smith is appointed Director of the Department of Arboreta and Botanic Gardens. 1991 The tram waiting area is renovated with teak benches and potted shade trees. 1991 Baldwin Lake dries up. As the water recedes, fish are removed and protective fencing is erected around the lakebed. The water table would come back up the following year. 1992 The Tropical Forest project is initiated. Overgrowth is cleared, the area is graded and new paths are mapped. Several trees, some donated and others relocated from other Arboretum sites, are planted in the project area. 1992 Summer hours are extended through twilight to encourage visitation. 1992 A statuary garden is begun near the waterfall with the donation of a 7-foot tall white marble sculpture commissioned by Anita Baldwin in 1930 for her Anoakia estate. 1993 The Department of Arboreta and Botanic Gardens is merged with the Department of Parks and Recreation effective January 1. Ken Smith resigns prior to the merger. 1993 The Rose Garden is renovated with the addition of perennials, companion plants and 150 new roses. 1993 Arboretum entrance fees are increased to $5.00 for adults, $3.00 for seniors and $1.50 for children. 1994 The Herb Garden is renovated to emphasize color. Casa Colima assumes major maintenance duties. 1994 An artificial pond with re-circulating water is added to the Tropical Forest. 1994 CAF initiates “Roots and Shoots,” a flower and vegetable gardening program for children, located on the site of the removed caretaker’s residence near Old Ranch Rd. “Tour and Taste” is initiated the same year as a summer program with short, specialized tours of a segment of the Arboretum followed by dinner on Peacock Terrace. 1994 Shuttle tram service replaces narrated tours of the grounds. Information boxes are placed at tram stops and other attractions. 1994 The name of the garden is changed from Los Angeles State and County Arboretum to The Arboretum of Los Angeles County. A new redwood sign will be installed at the Baldwin Ave. entrance in 1995 incorporating the new name and departmental reorganization. 1995 The flowering tree section atop Tallac Knoll is renovated with large-scale pruning and installation of a trail system through newly accessible plantings. 1995 The Lucky Baldwin fountain in front of the Queen Anne Cottage is restored with new plumbing and electrical systems and a fiberglass-sealed basin. 1995 The California Arboretum Foundation presents “Gardens of Our World” (Oct. 18-22), anew and expanded Garden Show featuring garden vignettes, tablescapes, lectures, demonstrations, and shopping opportunities. Robinson-May and the Los Angeles Times support and help underwrite the project. With changing themes, the show was intended to continue on a yearly basis. 1996 Los Voluntarios designs and publishes Garden of Eatin’, a cookbook of favorite recipes. Proceeds will benefit The Arboretum. 1996 Security lighting for the parking lot and decorative lighting at the entranceway fountain and sign are installed by Parks and Recreation. 1996 A new tram, the first to be handicapped-accessible, is purchased for The Arboretum through Parks and Recreation. 1996 Meadowbrook’s 1,000-foot streambed, plagued with leaks and silt build-up, is completely reconstructed through County Regional Park and Open Space District funding. 1997 Conductor Victor Vener moves his new California Philharmonic Orchestra to The Arboretum for a series of five summer concerts. Sell-out crowds and favorable reviews are promising. 1997 The Arboretum looks forward to the renewal of participation of Sunset magazine in the design, planning and funding of the Home Demonstration Gardens. The joint County/Sunset modernization project was completed in late 1998.